Any reason you did not include KB979099? vioplujjnsjzfg wrote: Any reason you did not include KB979099? if you are looking for an AIO you may consider Onepiece updatepack. Please excuse my ignorance, but since you already include Windows Rights Management Services (KB917275) in your pack, wouldn't it make sense to include the latest update or remove Rights Management completely? vioplujjnsjzfg wrote: Please excuse my ignorance, but since you already include Windows Rights Management Services (KB917275) in your pack, wouldn't it make sense to include the latest update or remove Rights Management completely? very sorry for the snapping at ya with the reply. my mind was elsewhere and my fingers were just typing away! have not got around to it. if i have the chance (which i should) it will be in the next release. user_hidden wrote: very sorry for the snapping at ya with the reply. and effort on your part often with little or no thanks in return. Thanks, again, for the reply and I'll look forward to the update when you have a chance. First of all thank you for all the effort that you put in making this update pack. I really appreciate it. Can you please tell me if these have been superseded by another fix in your pack? Does anybody have any problem installing kb974841 from this latest update pack? I tried querying the kb for this hotfix but can't find the full article just a small description. pegasus wrote: Does anybody have any problem installing kb974841 from this latest update pack? I tried querying the kb for this hotfix but can't find the full article just a small description. KB974841 has been in the update pack since version 1.1.7 which was released back on January 22, 2010. nothing has changed regarding that KB and the update pack. the KB you reffer to is an update for KB970238, which has a little more info. First, I want to thank you for all of your hard work on the update pack. I've been having a problem with this update pack for the past couple of months. The problem is very unusual. The install seems to go well, but afterwards, I am unable to install NI Labview 8.6. I receive MSI error 1603, "A fatal error occurred during installation". I am unable to resolve these errors, yet everything related to msiexec and the MSI services seem OK, log files yield no useful information (even in very verbose mode). I finally had some time to do extensive testing this weekend and I have been able to isolate the problem to this update pack. I have tested on virtual machines and real machines with identical results. Unfortunately, I have not been able to isolate the exact problem or cause. Using Onepiece's AIO pack and Xable's update pack do NOT envoke these errors. (but I really prefer the contents of this update pack). I integrated/tested with nLite 1.4.9.1 + QFE update pack only, and I have integrated/tested with RVMi 1.6.1 + QFE update pack only... yielding identical results. I'm wondering if others have experienced any MS installer errors after using this pack? ricktendo64 is correct. The problem is most likely KB972397-v2 which has proven to be buggy. The only solution so far, for OnePiece and myself at least, has been to revert to KB967756. Try this code for MSI. I did another build just using your latest update pack v. 1.2.1 w/ XP SP3 Pro. 32bit using ryanvm integrator. when i run qfecheck.exe after the installation, I get a kb974841-v2 (this hotfix should be reinstalled). I never got this problem on v. 1.1.9 of the update pack. yumeyao wrote: Try this code for MSI. pegasus wrote: I did another build just using your latest update pack v. 1.2.1 w/ XP SP3 Pro. 32bit using ryanvm integrator. when i run qfecheck.exe after the installation, I get a kb974841-v2 (this hotfix should be reinstalled). I never got this problem on v. 1.1.9 of the update pack. just did a build with MSDN_SP3pro + 1.2.1 only.....installed in virtualbox and qfecheck says "Current on system" for all KB in pack ! what RVMi are you using, perhaps try 1.61b2.1 ? as well what is your exact source and what other addons are you integrating? Strych9 wrote: I've been having a problem with this update pack for the past couple of months. The problem is very unusual. The install seems to go well, but afterwards, I am unable to install NI Labview 8.6. I receive MSI error 1603, "A fatal error occurred during installation". I am unable to resolve these errors, yet everything related to msiexec and the MSI services seem OK, log files yield no useful information (even in very verbose mode). i'll see if i get any errors on install. user_hidden wrote: what RVMi are you using, perhaps try 1.61b2.1 ? XP source is MSDN_SP3 (clean) +1.21 (and 1.20 last month) and for now, there are no other addons. I'm building a new version now in VMware integrated w/ RVMi 1.6.1 b2.1 (I was using 1.6 previously). Oddly, the MS article (KB972397-v2) describes the symptoms perfectly, but also seems to be the cause... Go Figure! Integration with RVMi 1.6.1 B2.1 +1.2.1 yielded the same errors. qfecheck -> KB972397-v2 Current on System. Strych9 wrote: Integration with RVMi 1.6.1 B2.1 +1.2.1 yielded the same errors. i was able to recreate your error on my test system but not the same error code. regardless i will be reverting back to KB967756 for the next pack to have more stability for MSI installers. user_hidden wrote: i was able to recreate your error on my test system but not the same error code. regardless i will be reverting back to KB967756 for the next pack to have more stability for MSI installers. Thanks so much for your help on this issue! Sometimes you have to step backwards to move forward! Thank you Rick. I will do so this afternoon after work. Anyone getting a BAD_POOL_CALL BSOD during textmode portion of setup? Only thing I've changed in my setup is this pack (from 1.2.0 to 1.2.1). I've never had so much as a hiccup with any of user_hidden's work, so I'm guessing it's something else. But I'm stumped, so I thought I'd ask. No problem here, RogueSpear, with RVMi 1.6.1b2.1 and pack 1.2.1 in VMware Server 1.0.10. From the "it's not you, it's me" files... turn out the Intel 9.5 sata drivers work just fine with q45 chips, but the downward compatibility in the .inf file is just for show. Sorry for the false alarm.. Thanks for your work on these update packs. Still got a lot to learn but I am getting there. With this update pack UpdatePack_1.2.1_20100309 I end up with a file "Shortcut to moviemk.exe" in I386 directory. This did not happen with UpdatePack_1.2.0_20100212 as I still have the ISO & CD that I created and that shortcut is not there. I did also practice a while back with UpdatePack_1.1.7_20100122 and I don't recall that shortcut being created. Started off with Genuine M$ OEM SP3 CD. Not Slipstreamed. Integrated update pack with RVMi 1.6.1b2.1. Last night I made ISO with this update and other addons and that was the first time I have seen this shortcut. Today I started fresh again and just added your update pack only and shortcut is created again. Does this update pack work different to previous packs. ? I did Properties of this shortcut and it has three tabs. On the 'Shortcut' Tab there is this information which I don't understand. Last edited by Ralfo67 on Wed Oct 13, 2010 7:25 am, edited 2 times in total. I suspect it was a slip of the mouse. 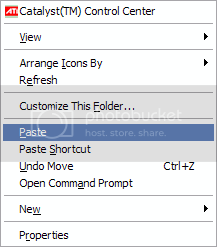 "Paste" and "Paste Shortcut" are awfully close together. 2. Integrate XPSP3_QFE_UpdatePack_1.2.1_20100309.7z with RVMi 1.6.1b2.1. 3. Look in D:\XPP_SP3_EN\I386 directory & shortcut is there. This has now happenned thre times. You misunderstand me, Ralfo67. I believe that when user_hidden meant to "Paste" the file into the update pack directory, he clicked "Paste Shortcut" instead by accident. The file is harmless. I'm sure it will be dealt with in the next release. For now, you can ignore it or delete it from your source before creating an ISO. Sorry 5eraph. I thought you where responding to my post. If that shortcut does not belong in the I386 directry where should it be please ? 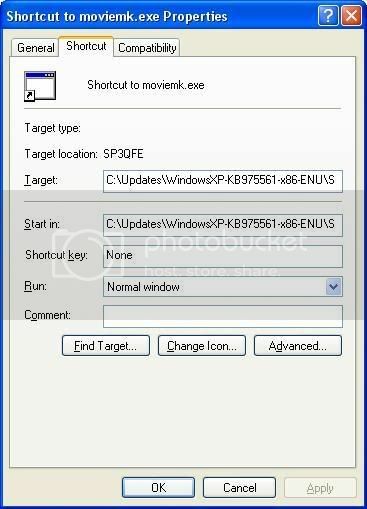 OK installed 7zip and there is a "Shortcut to moviemk.exe.lnk" 2010-03-10 in the update pack but not in the previous update pack..
[url=http://www.ryanvm.net/forum/viewtopic.php?p=103048#103048]5eraph[/url] [u]should have[/u] wrote: I suspect it was a slip of user_hidden's mouse. "Paste" and "Paste Shortcut" are awfully close together. You can delete the shortcut from your source after integrating the update pack, Ralfo67. You can also ignore it if you'd like. i have already noticed and removed it a few days ago locally. I have tried everything to fix this..if I plug the stick into a non reloaded PC it works...its only on a reload using this updatepack and I reinstall windows installer no luck but never seen this on any other program installs ever. 5eraph wrote: ricktendo64 is correct. The problem is most likely KB972397-v2 which has proven to be buggy. The only solution so far, for OnePiece and myself at least, has been to revert to KB967756. Is there a simple method to remove the troublesome KB972397-v2 & install KB967756 ? Is there an addon for this? I was having the same issue with this Update Pack. Fortunately, User_Hidden was able to isolate and duplicate the problem. See MS article (KB972397-v2) which described the symptoms perfectly. As requested above, an addon and an installer are now available. Because user_hidden's update pack has not needed the addon since v1.2.7_20100511, the addon is now only for OnePiece's update packs v3.6.2 and later. The installer can be used in any instance where a newer update is installed, regardless of update pack used—if any. Each of the following packages will remove the preinstalled KB981669 update from a Windows installation or installation source, respectively, that has been updated with the update pack versions listed above. Are no longer necessary with user_hidden's update packs since v1.2.7_20100511. QFECheck update verification is maintained. Registry entries for KB981669 are removed. Registry entries for KB967756 are added. Proper file signatures are maintained. Removes KB981669.cat from the catalog database. Adds KB967756.cat to the catalog database. Intended for OnePiece's update packs v3.6.2 and later. Works with RVMi 1.6.0 and nLite 1.4.9.1, or later versions of either. You must reboot for the necessary files to be replaced. A prompt will appear when the executable finishes. An entry is added to "Add or Remove Programs" with a link to this post for more information. This uninstaller is not uninstallable. To reinstall KB981669, use the update package available from Microsoft. [2011/12/05 09:10 UTC] - 2011-11_1 - Added the MSI Event Viewer registry fix made obsolete by KB979302. Addon is now only intended for OnePiece's update packs v3.6.2 and later. Installer updated to remove KB2388997. [2010/05/05 17:25 UTC] - 2010-04_1 - Updated to remove KB981669 in user_hidden's update packs v1.2.5_20100428 and v1.2.6_20100429. [2010/03/22 10:20 UTC] - 2010-03_2 - Addon only - Added IgnoreFileVersions flag for nLite compatibility. [2010/03/19 12:05 UTC] - 2010-03_1 - Initial release. Last edited by 5eraph on Mon Dec 05, 2011 7:51 am, edited 12 times in total. The addon can be used in the same session as the update pack with other addons if desired. It's a fairly simple addon. I'm glad it works for you. The x86 installer is a cut down version of the x64 version—same process, fewer files. 5eraph wrote: The addon can be used in the same session as the update pack with other addons if desired. It's a fairly simple addon. many thanks for the help 5eraph. Thanks for your hard work user_hidden, also thanks to 5eraph by the fix. great achievement , thanks for sharing with us all. i was integrating this XPSP3_QFE_UpdatePack_1.2.1_20100309.7z into a Multiboot OEM XP Pro pre-intg SP3 32bits disc, through nL 1.4.91, on a WinXP-Pro-SP3 computer. there were warning+Prompt message for replacing new file with older version for the KB967756 Rollback dll file(s) and for WG Validn tool dll file ... i clicked on 'no' to use the old versions. when nL finished its integration stages , then i used (not nL, but) the DP's DPs_BASE_8125.exe to integrate drivers, just before making the iso in nL. but the resulted iso/disc did not work ... when installing (vmware vm) , after 1st reboot, all DPs get decompressed , but then setup just keeps on Rebooting again and again ! these are the things i have in addon list now, in exact order ... (1) RVMAddons_1.9.2_UH.7z , (2) XPSP3_QFE_UpdatePack_1.2.1_20100309.7z , (3) KB967756 Rollback 2010-03_1 , (4) OnePiece_Microsoft.NET_Framework_v1.1.4322.2443_True_AddOn_ENU.cab , (5) MS RunTime Libraries Pack v1.4.8 , (6) KB933579 hotfix , (7) WIC 1.0.1 , (8) KB971314 hotfix , (9) OnePiece IE 7 v2009 , (10) HashTab 3.0 , (11) Open Command Prompt Shell Ext v2.0.3.0 , (12) 7-Zip 4.65 , (13) CPU-Z 1.51 , (14) GPU-Z 0.3.9 , (15) ImgBurn 2.5.10 , (16) VLC 1.0.5 , (17) Media Player Classic 6.4.9.1 , (18) Real Alternative 2.0.1 , (19) Quick Time Alternative 3.1 , (20) google-talk , (21) Java Runtime Env 6 upd 18 , (22) Firefox 3.6 , (23) Opera 10.50 , (24) Safari 4.0.3 , (25) Notepad++ 5.6.7 , (26) Adobe Flash Plugin 10.0.45.2 , (27) Adobe Flash ActiveX 10.0.45.2 , (28) .Net Framework 3.5 SP1 v2009.10.24 yumeyao , (29) DirectX End User Runtimes (x86-32) v0.9.0 , (30) doPDF 7.1.330 , (31) Audacity 1.2.6 , (32) VirtualDub 1.9.8 , (33) Free Download Manager 3.0.848 , (34) GIMP 2.6.7 , (35) Pidgin 2.6.6 , (36) Thunderbird 3.0.3 , (37) Unknown Device Identifier 7.0 , (38) Sysinternals Suite v2010-01-14 , (39) Multi-Patch: UXTHEME.DLL v1.4 , (40) Aquanox v1.0 , (41) Dougiefresh Ram Disk v3.0 , (42) Process Priority Saver 1.98_v1 , (43) Unicode Vista SP2 v1.626.6002.16497 , (44) IE7Pro 2.4.7 , (45) Windows Genuine Validation Tool v1.9.40.0-2 , (46) ieSpell . what may cause this type of behavior ? how should i fix/do it ? Last edited by Tareek on Mon Mar 22, 2010 7:07 am, edited 1 time in total. I have updated the KB967756 Addon to prevent the old file version warning in nLite. Thanks for the feedback, Tareek. nLite should only be run once on any given source. Always start with a clean, unaltered source. Update packs should always be at the top of the list in the "Hotfixes, Add-ons and Update Packs" section. If you're having problems with nLite in general, post them in nLite's forum on MSFN. Do not forget to attach your "Last Session.ini" there. If the update pack or addon is specifically stated as being nLite compatible, post your "Last Session.ini" in the pack or addon release thread when having problems. ... many many thanks, 5eraph . things are getting inside me slowly. another user had almost similar problem at MSFN nL forum, so i posted my problem under that thread. DPs were causing such "reboot" behavior. whats your advice on integrating the entire DP, into a XP+SP3 disc ? Use the DriverPacks after using nLite, as the last step before creating an ISO. not sure if this can be fixed small deal I know but sometimes I forget to set the time. If when you open "Date and Time Properties", the "Current time zone" is being displayed as "Eastern Standard Time", you have two choices. First, you can change to another time zone then return to your proper time zone and it will change to "Eastern Daylight Time". Second, you can run this command "tzchange.exe /F "Eastern Standard Time" /S 3 0 2 2 0 0 0 /E 11 0 1 2 0 0 0 /G". I don't know why the tzchange run commands were removed from the pack, but I have this issue without at least adding the one for my time zone. This still isn't flawless, as when I do an install the time zone is correct when finished, but the time always bumps forward by one hour when the install is done between the "New" jump forward and the "Old" jump forward date (think that is this coming Sunday morning). The time zone will also be correct without any further action after the "Old" change date passes.